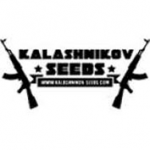 Kalashnikov Seeds - Kalashnikov Express. Free US delivery. This strain was based on the old reliable Kalashnikov Original, cross bred with genetics which would fasten the flowering and bud development. It has higher Indica phenotype percentage, therefore the plants are shortish and squatty, though branchy. The buds are massive and very Indica-like, close to Big Bud and such super delivering strains, but very dense on the inside. Very productive.